This glass door from a home in Dickson was smashed during an attempted break-in last Friday. Photo: Facebook. There has been a spate of break-ins in Canberra’s inner north in recent months with glass doors smashed and jewellery, laptops and other goods stolen from a range of homes. In the past 10 days alone, jewellery handed down from a grandmother was stolen from a home in Downer and a glass door was smashed at a Dickson house while the owner was actually home. 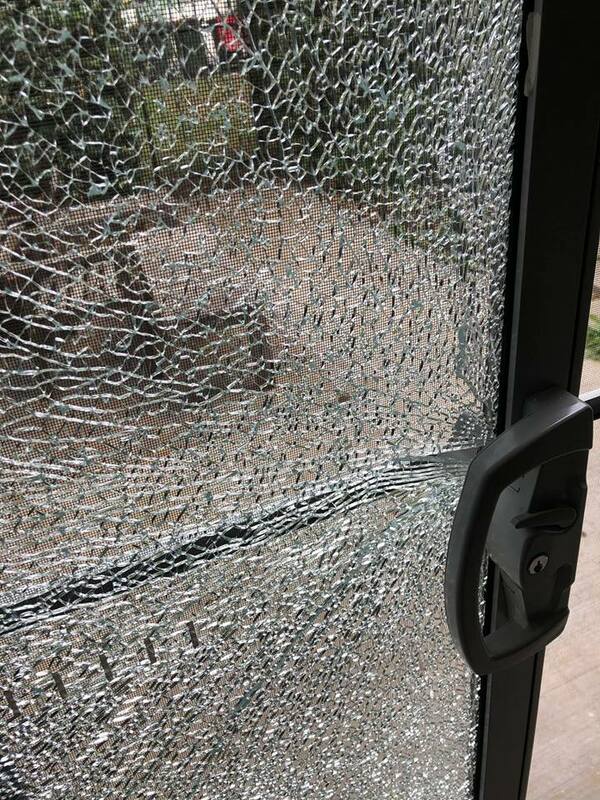 A glass replacement service says it has seen a lot more activity in the area in recent months, with sliding glass doors and balcony doors smashed despite the loud noise that makes. “We have replaced quite a few broken door panels between Braddon and Downer including Turner and O’Connor in the past few months,” said Jock Croker of Croker Glass Service. “We’ve had a lot more call-outs than we would generally get in that area. Mr Croker said that ground floor apartments are among the places that appear to have been targeted. Affected Canberrans have taken to social media to warn people of the break-ins or in the hope of getting their belongings back. “Just a heads up there is a criminal going around Dickson area breaking into people’s houses,” wrote one man on Facebook about an incident that occurred last Friday (April 5). A Downer woman tweeted on April 4 that her house had been robbed the previous day. “The man stole everything!” she tweeted. Another Downer homeowner wrote on Facebook that his home had been broken into in mid-February. “The guy targeted jewellery and filled our bags with our stuff then stole my push bike to get away on,” the man wrote. Region Media has also seen recent Facebook posts about a break-in at a house in Ainslie and a break-in in Braddon which involved broken glass and the theft of laptops. A spokesperson for ACT Policing said that around 11:30 am on Tuesday, April 9, a 55-year-old man was arrested for multiple warrants, possession of stolen property, and going equipped for theft. “He appeared before the ACT Magistrates Court on Wednesday, 10 April where bail was refused,” the spokesperson said. Fingers crossed that the capturing of the 55 y.o. will put an end to this spate. Tracy - have you sent photos of your items to Cash Converters? They are great with identifying stolen goods. Lara Redfox Jurkiewicz good idea! Thanks Lara! Letterboxes in some Kingston apartments were also broken into last night. And there were ram raids at Lyneham shops too. Low lifes.